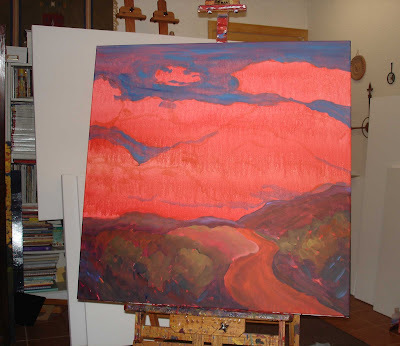 This is a big cloudscape in progress. It's 11pm and I just finished underpainting everything but the sky. I should finish tomorrow. Lots to do before the show so have a great Monday! This painting is in the middle stage, I guess you could say. I have painted and outlined the background but haven't decided what colors I want to give the little hummer. It also hasn't been sealed, which gives it that sharp and shiny finish. 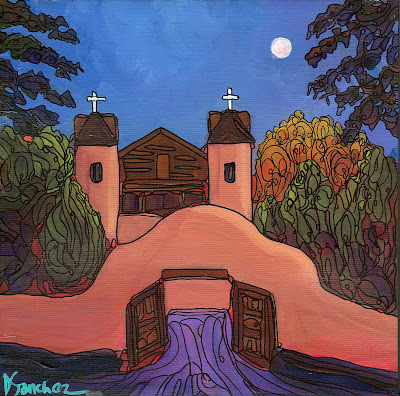 Tomorrow I will be working on a 36"x36" big sky and a 20"x16" Taos acequia. What a wonderful way to spend a Saturday! 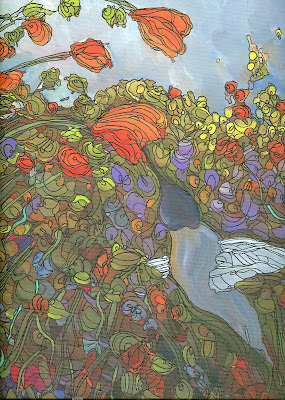 A work in progress - 24"x30"
This is the finished painting without the heavy highlights. I will post the finished version after outlining. 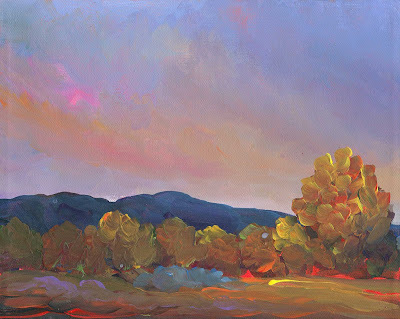 "TAOS GLOW SUNSET WITH PINK"
My gallery is moving to a new, much larger and more beautiful space in April and we artists are picking up our inventory for transfer. I only had two paintings there and this one you haven't seen before. It has a beautiful New Mexico sunset with just a hint of pink. I didn't get a lot done in the studio today, ran errands, and did paperwork. 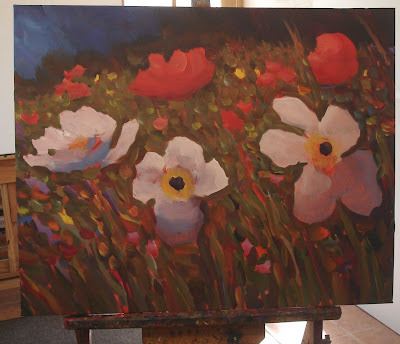 Tomorrow I will be starting two new paintings; a medium size poppy meadow up close, and I haven't made up my mind about the other one yet! Oops, I just realized I didn't ever post the 2nd stage of this painting, I'll post it now. This looks really weird right now, I know! It's actually a beautiful New Mexico sunset if I can get it right. I will probably stop here and continue on tomorrow. that was in progress and you haven't seen yet. to get everything done and then I get in the zone and it feels like magic to me. You'll see this finished piece tomorrow night (hopefully!). 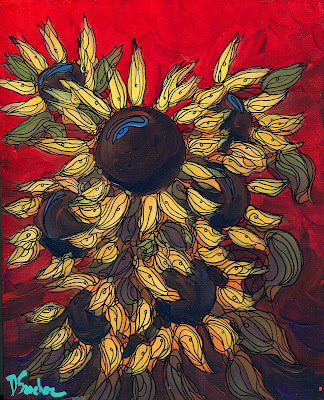 Another work in progress - five sunflowers, 24"x30." 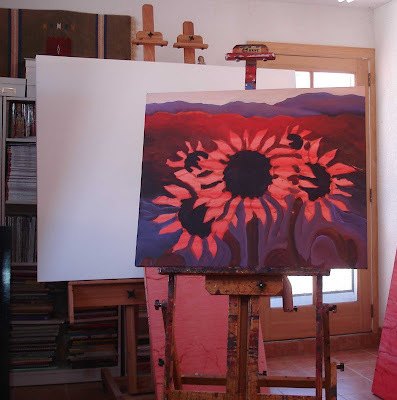 This is the underpainting and I'm waiting for it to dry so I can tackle the sunflowers. I will try to post a more complete version tonight. I am still hard at work for the show. 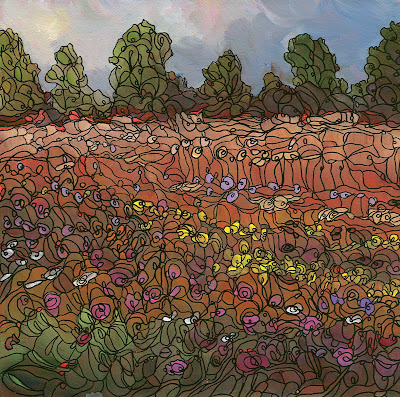 This is a wildflower painting, just a wild jumble of springtime. so the shots aren't as clear and crisp as my slides. This 24"x30" painting is a work in progress for the show. and leave them out of the mountains and the foreground. you may be seeing it in some of the forthcoming works. 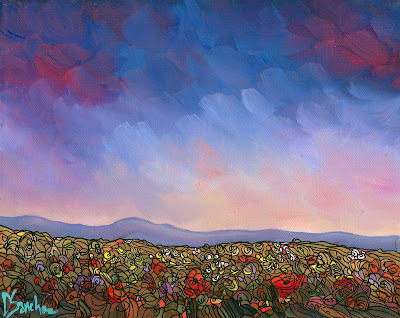 Tonight's painting is a trio of poppies in a hidden canyon surrounded by a few purple asters. 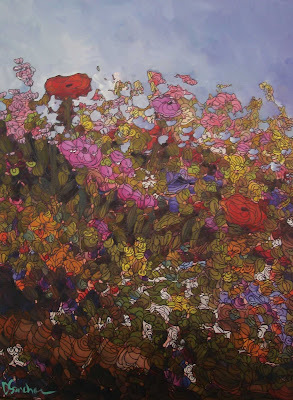 When I finished the painting, I noticed that there is a circular vortex in the middle of the painting. Even though it's a simple piece, there's a lot of movement going on. My postcards for the show are ready! Everyone who is on my mailing list will receive one. If you'd like a postcard - especially if you're local, because if you bring it to the show you have a chance to win something special - email me your name and mailing address. Good night! This painting is the study for a larger piece I will be working on tomorrow. The meadow is not so much about a "spring" meadow or even flowers but about the landscape toning down, getting ready for dusk and nightfall. It's just all about the sky! A work in progress. I'm not sure where this is going yet. I think it's going to end up being a view of a New Mexico forest glade. Yes, New Mexico has forest glades! You just have to know where they are. Even though we are considered desert, which means heat and dirt, nothing could be further from the truth. New Mexico has beautiful rivers, green belts, and we even have forests. 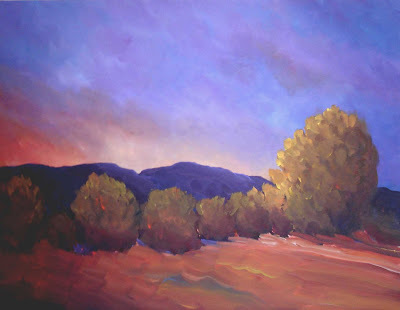 Today is a day for running errands and taking care of business, then getting to work on a large skyscape painting. I will also try to have a daily painting to post tonight. Have a great Monday! Hi everyone, here's is tonight's daily painting. I wanted to tone it down a little and go for a soft, misty sort of look. 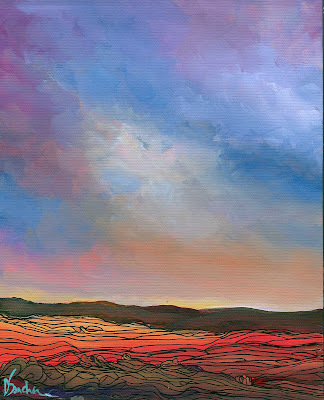 I'm starting a BIG sky painting tomorrow and will post images tomorrow night. for my upcoming April show and need some practice. 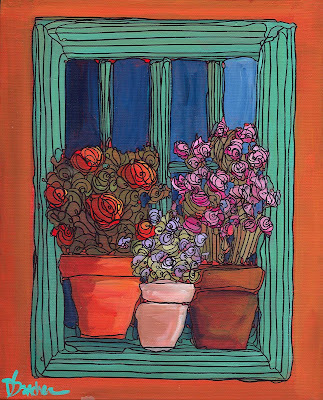 Finally, a new daily painting! I've spent most of the day outlining but I miss little dailypaintings. 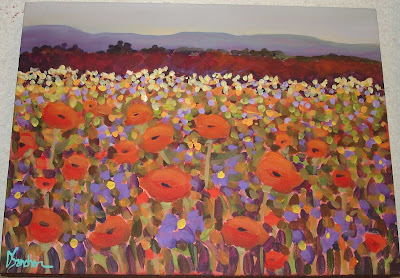 I knew I wanted to paint poppies with mountains in the distant background and this is the wildness that emerged. I love the colors, they have a really warm feeling. 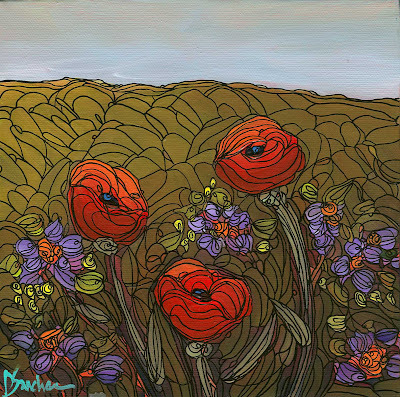 This painting is a wild and crazy spring poppy field. 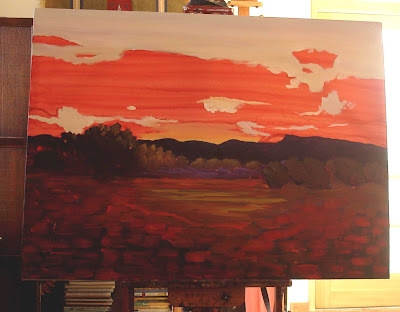 It's in the underpainting stage right now. just one word that, to me, evokes the feeling I'm trying to give the piece. hope I spelled that correctly! I won't have them professionally photographed until right before the show. So if you want to see the finished pieces, hhmm, maybe you'll have to come to the party at the opening reception! 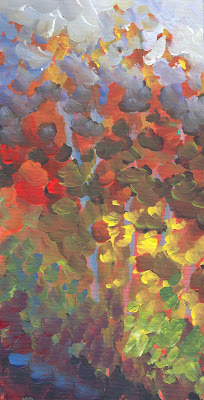 Daily painting should be ready tomorrow night. This is a work in progress. It's 16"x20" and untitled, as of yet. It's a view of the Sandia Mountains from the north side. Simplified, but I like it. I know the vegetation is not as colorful in real life! 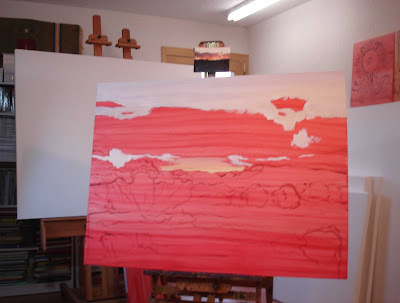 As you can see, I am starting on large canvases for my show in April. I'll admit, I'm a little behind schedule. But I'll make it. 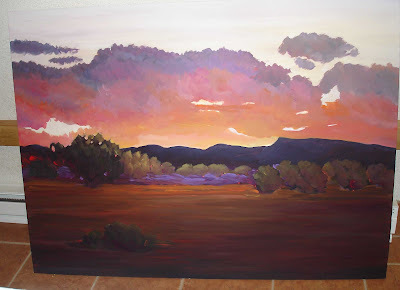 These paintings will be lots of beautiful New Mexico skies, sunsets, sunrises, landscapes, and wildflower meadows. Maybe a few sunflowers for good measure! I will post a quick photo of each one as it's completed and I will try to post a daily painting or two while I'm working. Thanks to all of who who watch daily and I thank you so much for your support. You all motivate and inspire me with your comments and feedback. 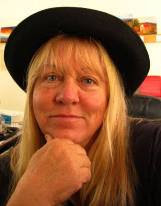 Tonight I'm going to the Harwood Art Center for Open Studio Night. the artists open up their doors to the public and display their work.. I'm considering renting a studio there so I'm going to go and check it out. 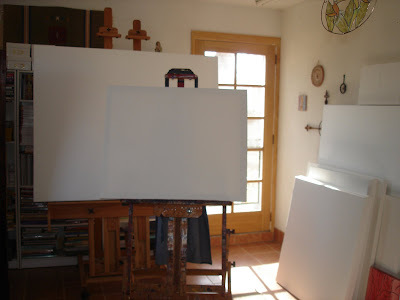 Tomorrow I begin working on large canvases. 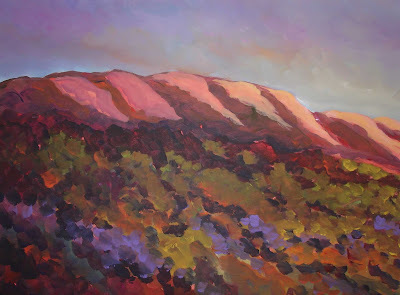 This is a painting I just completed for a friend in California. I'm hoping to have a new painting up for post tonight. Here is the daily painting I've been working on. I am pleased with the way it turned out. 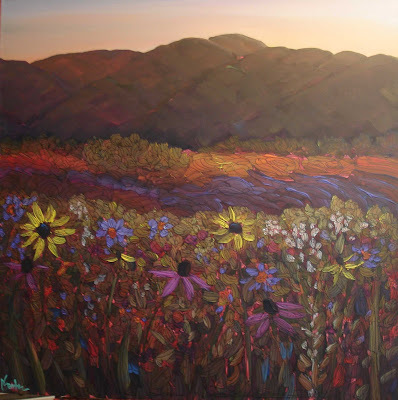 I love the blue shadows on the faces of the sunflowers and the contrast with the red. To purchase, please click on the PAYPAL button on your upper right that says Buy Now. Thank you! 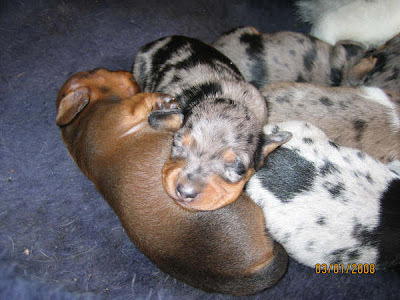 They are getting SO cute!!!! 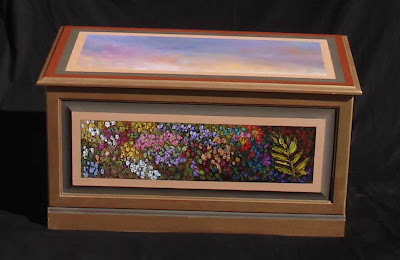 Here is the completed hope chest. I delivered it yesterday. 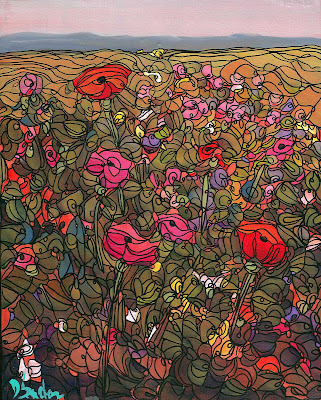 then on to the April Weems Gallery Old Town show. I am hoping to have that little sunflower painting finished and up for posting tonight.